the Carolina paroquet is extinct. the aforesaid 4 cottonwoods (which are really 6 contorted trunks). along with lisping white-crowned sparrows. been staying here exactly one week. Male kingfisher rattled by the other day. (When I read this poem to my four-year-old he jumped and hooted, laughed and wagged and wiggled with fleshy fullness). The nominal amplification provides poetic texture in the syllabic exchange of vowel and syllable, the quick, trochaic Anglo-Saxon stresses hitting the first beat of most words: “dipper, dapper, dopper, broad-bill, blue-bill.” The alliterative distribution of the alveolars /d/ and /t/, along with the bilabials /b/ and /p/, maintain a drum-like rhythm that is syncopated by subtle vowel cadences: “dumb-bird, dumb-gird, mud-dipper.” The interplay of the mid central vowel and the higher front vowel /I/ receive the plosive /d/ and bilabial /m/ to give the line a measured, bird-like cadence. Indeed, this stanza uses colloquial names for the ruddy duck to approximate a kind of mimetic bird or duck-like call, invoking the duck’s presence to the reader through the nominal amplification of its name and through syncopated aural rhythms. Lincoln’s sparrow gurgles from the willow bush. somehow in through/out the six whole cottonwood boles. The incursive nature of these arrangements invites a reader’s curiosity and they present patterns through which we observe the poet in his observations. The inherent relations matter, observing a quietude or modesty of speculative presentation suggesting that self is composed of its environments, both present and recollected. These incursive movements extend the invocation of the bird talismanically, the road runner-runner here a kind of familiar by which “Lincoln’s sparrow” receives its formal registration. The prosodic precision is contained by colloquial language that gives to these stanzas a sense of effortlessness. Probably, the kinetic attentions involved here of pen, eye, mind, and memory are so enmeshed that such prosody is integrated thoroughly into Collom’s practice so that art and life blur, and words in-form experience. 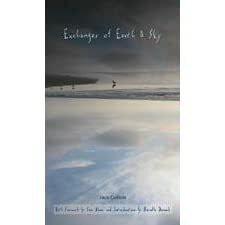 Exchanges of Earth & Sky offers a delightful personal and phenomenal investigation, and it shows an approach to composition that stresses process over product, the material weight of words catching the flitting and unpredictable movements of nature.